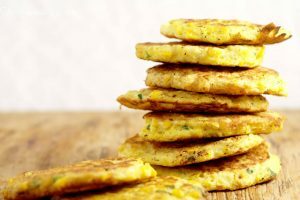 This fried corn cakes recipe combines fresh sweet corn and green onions to make a salty, sweet, and filling side dish perfect for summer and all year long. Today I want to share a yummy side dish recipe that’s perfect for summer. Fried Corn Cakes! 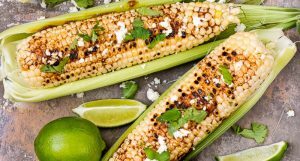 Sweet corn season is The. Best. 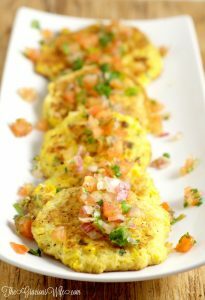 And these fried corn cakes are a perfect alternative to serving it on the cob. I love to buy sweet corn in bulk during the summer when it’s both delicious and on sale. It freezes really well, so I just shuck it and pop it in a freezer bag still on the cob so that it’s ready when I have a corn craving. These fried corn cakes are pretty salty, as I believe corn needs lots of salt. It’s one of the few things that I actually salt heavily. If you don’t hold my corn saltiness beliefs, you should probably half the amount of salt to 1/2 of a teaspoon. 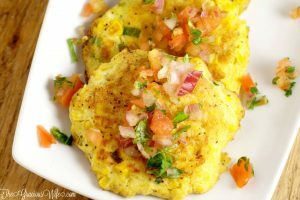 Fried Corn Cakes are also delicious by themselves, but if you’re looking to spice it up even more, I recommend serving them topped with crisp, fresh pico de gallo to round out the flavor. Process half of the corn kernels in a a food processor or blender so that they're finely chopped, but not pureed. Add the processed corn, the other half of the corn kernels, green onions, 2 egg yolks, oil, salt, pepper, and garlic powder to a large mixing bowl and whisk to combine. Be sure to save your egg whites! Next add your flour and corn meal and gently stir, just until combined. In a medium bowl, beat your egg whites until soft peaks form. Then gently fold into the corn cake mixture. Heat a large skillet over medium-high heat with the butter. 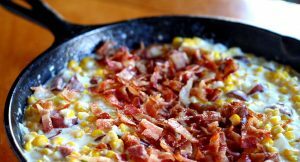 When skillet is hot and butter is melted, you can add your corn cake batter. I add about 1/4 cup of batter and only cook 2 corn cakes at a time so that I still have room to flip. 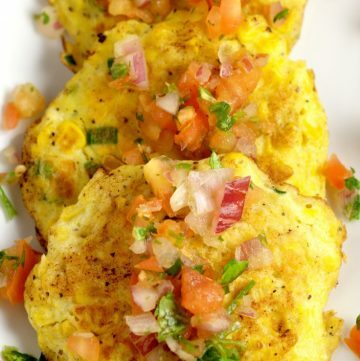 Cook each corn fritter for about 2-3 minutes on one side, or until lightly browned. Flip the fritter over and continue cooking on the other side for an additional 1-2 minutes, or until lightly browned. Serve warm. Consider fresh toppings such as this crisp and slightly spicy pico de gallo recipe. 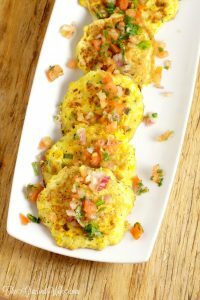 Did you like this Fried Corn Cakes recipe? 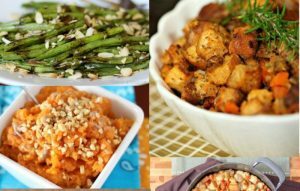 Find more on my Salads & Side Dishes, Main Dishes, and Summer Days boards on Pinterest! I would love to have you hop over and join the fun at Inspire Us Tuesday! 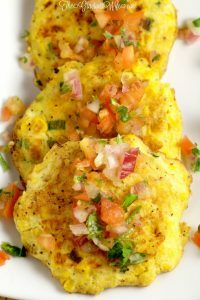 I love the idea of corn cakes and pico de gallo! What a lovely fresh summer treat! Yummy! This looks delicious!! I would love if you stopped by My place and shared your stuff on My 2 Favorite Things on Thursday – Link Party!! Yum yum yum!! 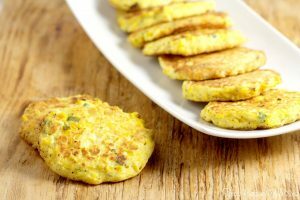 I love corn, in all shapes and forms, but these corn cakes look so tasty 😀 Thanks for sharing this with us at Friday Favorites!! The colors are gorgeous and I can imagine the flavor is amazing! Definitely sharing! They were very tasty, however they didn’t bind. I made these but i reduced the corn by half then added carrot cauliflower jalapenos and a bit of bell pepper with a comeback sauce to dip. This was supposed to be a side to Nashville hot chicken but 8t was so good I had to make two batches because I ate the first batch for lunch. Chicken was good too but the fritters Stole the show for sure. 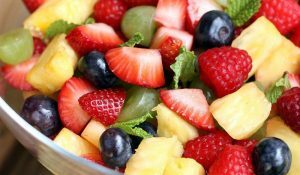 Would this be good to make ahead and freeze? If so, when would you suggest freezing (after mixing but before cooking, sfter cooking)?